We have been receiving quite a bit of email from Cloudeight InfoAve Premium newsletter subscribers, telling us that they’re not receiving our InfoAve Premium newsletters for the past few weeks. We have sent our newsletter every week for past 787 weeks – we haven’t missed a week. So, if you’re not getting the newsletter either you ISP is censoring your email or it’s being automatically dumped in to your spam/junk folder. Gmail has recently updated and if you’re subscribing with a Gmail email address and you’re not receiving our Cloudeight InfoAve Premium newsletters, read on. This is a good time to remind all of you who subscribe to our InfoAve Premium newsletter using a Gmail address, to open your Gmail spam folder and check to see you find our Cloudeight InfoAve Premium in your spam folder. If you find our InfoAve Premium newsletter in your Gmail spam folder, right-click on it and click “Not spam” and from then on – or at least until Gmail has another major update – you’ll find our newsletter in your inbox every Friday. What? 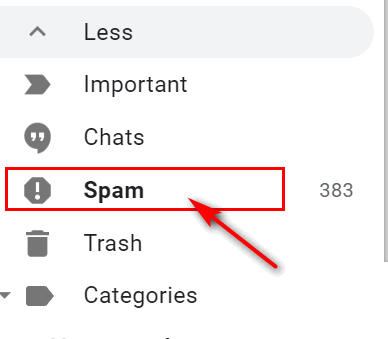 You Don’t see a “Spam” folder on Gmail? Open the Gmail spam folder. Look for Cloudeight InfoAve Premium in that folder. If you see it, right-click on it and mark it “Not spam”. From then on it shouldn’t go back into the spam folder — unless Gmail has a major update again. So, if you’re one of those who subscribe to our Cloudeight InfoAve Premium newsletter using a Gmail account. this will help you make sure that our newsletter is not placed in the spam folder anymore. I get your daily but I am not getting my premium cloudeight at all. I have AOL and I always check my spam folder it’s never in there. So I don’t know why I’m not receiving it. Could it be that I’m not on the list anymore? I just double-checked and you are on our Premium list. So, what’s happening is AOL (Verizon/Yahoo/AOL) is deleting our email off the server. You will need to contact your provider – they’ll tell you that they don’t do that… but they sure do. Your best option is to get a Gmail or Outlook.com address and subscribe with it. If you need help doing that, let me know. I’m afraid if you keep trying to use an AOL email address, you won’t be able to get our newsletter. All we can do is send it every week – we cannot force your ISP to deliver it. They differ but I believe I am still getting the full version of the newsletter, a great little advice column, I add. It reads as it should reply-to: Cloudeight InfoAve Premium and cloudeight-news @ thundercloud.net in brackets. I access your Premium Newsletter from C8 Startpage and read it online. Gave up on any intelligent or helpful ISP email ‘conversations’ a long time ago.